This introductory adventure for Starfinder clocks in at 50 pages, 1 page front cover, 1 page editorial, 1 page SRD, 1 page advertisement, 1 page back cover, leaving us with 45 pages of content, so let’s take a look! All right, first things first: This takes place in the shared Xa-Osoro setting of Everyman Gaming and Rogue Genius Games, to be more precise, in the somewhat lawless region known as Blood Space. In also assumes the PCs have their own tier 1 starship, which is provided, stat-wise. I know that my PCs would want to customize it before play, but yeah. That’s not a downside, just something to bear in mind. We also get 4 pregens for the adventure, which are presented with rules-relevant components and stats, but sans names, background, etc. – the mechanical framework is done, but that’s it. Alas, I noticed pretty serious glitches in one of them. I recommend disregarding them and making your own characters. Just make sure that they know their battle-stations. Huge plus: We get a fully mapped, full-color rendition of the starting ship – and yes, only with keys, but that’s okay – after all, it’s the PC’s ship! Other locations in the module come with b/w-maps and these maps actually come with player-friendly, key-less versions to print out, cut-up and hand out as you see fit. That’s a big plus. Now, it should be noted that this adventure assumes that the PCs are less of a mercenary bent and that they behave heroically; for neutral or evil PCs, a certain section might well see them abort the module. Not a downside per se, but it’s something to bear in mind. The module sports copious amounts of read-aloud text, helping GMs less versed in flavorful improvisation. …all right, and this is as far as I can go without delving into SPOILERS. Potential players should jump to the conclusion. So, after a brief read-aloud text, we begin immediately with a ship combat, as pirate raiders burst from the hazy red viscera of blood space! What’s that? It’s a cool unique terrain/hazard. It’s weird. Unsettling. And really cool: It’s the metaphysical blood of a dead star/deity and it may corrupt you and turn you mad. Fun! The pirate raider sports btw. a grappling beam, which is something PCs will probably want…but whether or not they lose the dogfight, the next step would be to deal with the mad raiders. And yes, their fervor has mechanical repercussions. That being said, we do not get a map of the pirate raider, so you may have to improvise there. Anyways, exploring the raider-ship is horrific and should conjure flashbacks of Firefly in the best of ways, as well as providing further angles. Unbeknown to the PCs, the encounter with the pirates has left them with a stowaway, the xaosnarr…which is odd, yes, but may actually be befriended! In, what I take to be a nod to Futurama’s Nibbler, the critter can eat radioactive material and sniff it out – something that may prove to be rather helpful… Why was it aboard the PC’s ship? Turns out that their cargo hold contains a Hematomium artifact that the critter really wanted – dark, radioactive and potentially addictive. Just two hours away, at the Dust City moon base Lunox, in the pre-paid dock, the PCs are scheduled to take their new drift engine anyways, which may be a good place to research and find out more. And yes, the pdf sports troubleshooting advice if the PCs kill the weird pet, fire the artifact into space, etc. – kudos! Dome 421 is btw. fully mapped and dialogues also provide sample guidelines. Here, the PCs may do a bit of space-sleuthing, find rumors and enjoy a nice cup of KafKafé –made of insects, obviously. This is probably one of the best things about this module: Without resorting to just a ton of exposition, the pdf brims with these small, glorious and inspiring details. Matt Banach’s myth-weaving and indirect storytelling really gets to shine here. And yes, there is a cantina. With band. Drunken legionnaires. Come on, space bar fight! Once the Pcs have had their dose of exploration and sleuthing, we’ll have the antagonists make their play and attempt to steal the artifact from the cargo hold…or the PCs directly. Once more, there are multiple ways this can go and the wayang operatives (see Starfarer’s Companion for the racial stats) are nothing to sneeze at. Cool: Instead of railroading the PCs into losing the artifact, the pdf does account for their triumph! Big plus there! As an aside: Yes, we get stats for the authority here and the security droids – an optional complication, sure, but one I welcomed. Either on a chase, or by comm.-device and a mutual agreement, the PCs will have to move outside on a buggy. The lunar surface has only a thin atmosphere, which makes for a complicating hazard here I enjoyed. Moon buggies are btw. stated and en route, the PCs can encounter hydrophagic wasps and silt sharks as they make their way to the security perimeter of atmospheric plant XJ-97, hopefully sans being killed by the security drones. Ultimately, the PCs will have to stop Targ Grazza, a corrupted variant solarian, from attempting to use the facility to disperse the artifact through the atmosphere, creating wide-spread madness, plague and genetic mutations…Oh, Tarq? Weregorilla. The mad solarian follows the dark cult of the Red Spiral…and yes, if that resounds with themes of Dead Space’s Marker, as seen through the lens of space opera, then you’d be correct! Editing and formatting are very good for the most part, though a few glitches have crept into the pdf, also in rules-relevant contexts. Not enough to impede the use of the module, but they’re there. Layout adheres to a nice two-column full-color standard and the pdf sports quite a few solid full-color artworks. The pdf comes fully bookmarked for your convenience. Cartography is b/w, apart from the PC ship, and high-quality. As noted, the player-friendly maps are a big plus. The pdf comes with a second version of a smaller size, which makes it more tablet/mobile device-friendly. Matt Banach’s introductory adventure for Starfinder is inspiring. 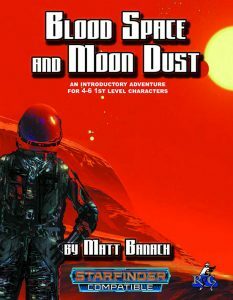 I had read about Blood Space before in the Star Log.EM-series, but until I read this module, I never got how unique, fantastic and imaginative the whole region is. The idea of strange, anomalous viscera in space, the echoes of bloody madness and the blending of the cute and innocent and the dark managed to evoke this rare sense of cohesion that really stood out. This, in short, reminded me a lot of the world-building of Firefly, without being a copy-cat. We have at once a fantastic section of space that you want to explore, that fires up the imagination; at the same time, it is a precarious line to thread and the cosmos may be a brutal place. Instead of the insistence of later Star Wars movies to cater to the lore established in hundreds of books and the throwing in of weird details to be explained at a later date, this supplement introduces, piece by piece, tiny tidbits of culture, creatures, processes and settings – unobtrusive, organically. It’s a presentation as we’d see it in a good novel, and the pdf is indeed better off for taking that route. Unlike many a supplement, the PCs also get to actually grasp the entirety of the plot, piece it together, etc. – in short, great storytelling. In short: The adventure is fun to read. While it does sport a few minor hiccups, being an early supplement for a new system, it is one impressive adventure and one I’d wholly recommend checking out. While it may not be perfect, it is a fantastic first adventure foray for the author and I really hope we’ll get to see more from Matt Banach’s pen. My official, final verdict clocks in at 4.5 stars, though the minor issues noted before prevent me from rounding up. If you’re in for the lore (or enjoy the same things I do), then consider this to be 5 stars + seal of approval instead – for me, as a person, this is amazing, but as a reviewer, I can’t rate is as such. You can get this flavorful, cool module here on OBS!